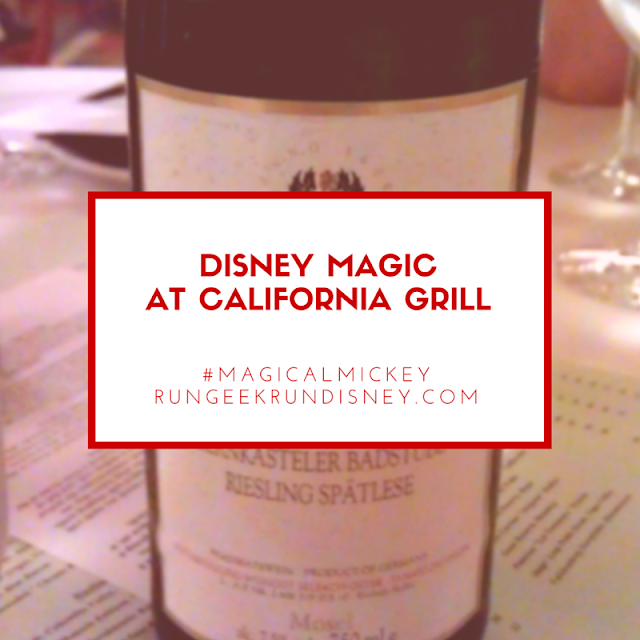 I've dined at California Grill on several occasions. One very special time was on our honeymoon. We got a reservation close to the fireworks times, with enough time to eat before enjoying the view for the fireworks. We were looking for a special meal, so decided to get a bottle of wine. We left it up to the recommendation of our server, Lisa, from Bucks County, PA. My wife told her we'd like a rieslings, something a little sweet, but not too dry. She said she had just the wine, and came back with a bottle of Selbach-Oster. We ended up enjoying a lovely meal, the fireworks, and two bottles that night. Fast forward 2 years. We're vacationing with my family and have a reservation at California Grill. My wife and I are remembering our last dinner here, but can't remember the wine we had that night. Then, our server arrives at the table and feels oddly familiar. We decide to go the recommendation route again and explain the wine we had as best as we could. Then, the Disney magic happens. She asks if last time we were here, if we were on our honeymoon. She thought we looked familiar, remembers us and remembers the wine we had that night. Yes, 2 years later, we happen to have the same server, who remembered us, and found our amazing bottle of wine. That was some kind of magic. Have you ever had that "how did that happen" experience? What a wonderful experience! Those little bits of Disney magic are one of the things that keep me coming back! that is why I keep going back to Disney-stories like this!